So you want to change/update your SBI account registered mobile number and visiting your home branch to do this, but wait you can do this online, no need to visit the branch. 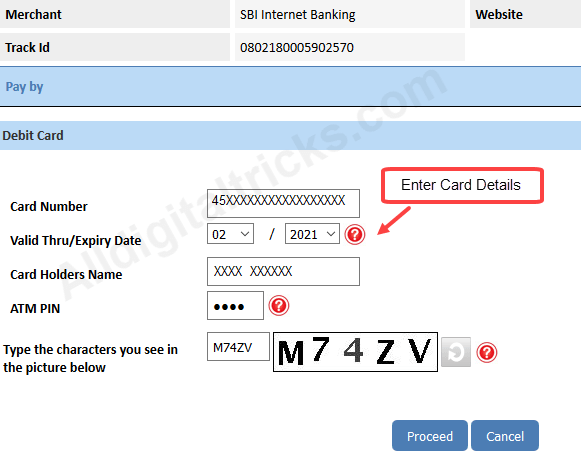 Today we will tell you how to change registered mobile number online for your SBI account. State bank of India now providing online facility to complete most of the basic small works like register your pan card, apply atm card, activation for card and many more. For this you must have State bank Net banking facility, if you have this then you can do all bank related works online without visiting branch. So let’s see how you can change your sbi account registered mobile number. The process is simple and takes less than 10 minutes. Before we start keep your old number activated because you will receive OTP password on it. Keep ready your ATM/debit card and PIN. 2 After login to your account click on My Account & Profile tab, and here you have to click on Profile. On next screen you need to enter profile password, enter it & proceed. 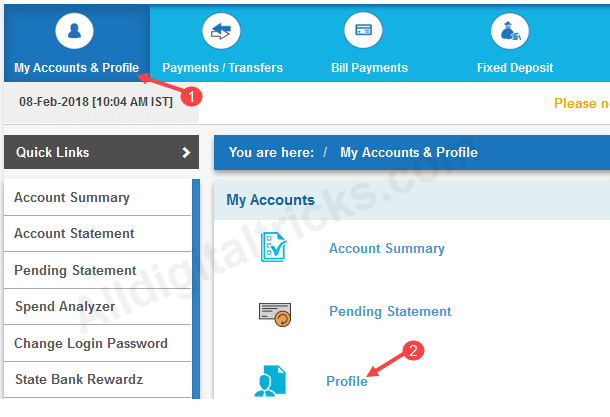 4 In profile you can see “Change Mobile number-Domestic only (Through OTP/ATM/Contact Centre)” , click on it. 5 Now enter your new mobile number, once again re-enter mobile number and click on submit. 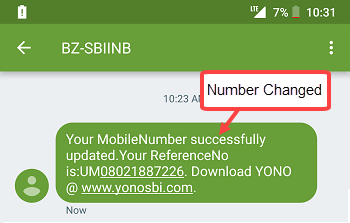 6 After submitting new number, next screen you can see 3 options to change your registered number. Select “By OTP on both the mobile number” option and proceed. 7 Now select your account number and click proceed. 8 Next screen select your ATM/Debit card and proceed. 9 Next screen you need to enter your card details. Enter Card number, expiry date, name and ATM PIN. Click on proceed. 10 Now you will receive OTP & reference number on your both (old & new) mobile number as you can see below screenshot. 11 You need to send this OTP and reference number to 567676, see below screenshot. 12 After successfully sending OTP and Reference number from both numbers (old & new), your mobile number will be updated. You will receive an SMS on the new number. Wait for 24 hours. So this is how you can change/update your sbi account registered mobile number through net banking. You can also change your number through ATM and contact center as mentioned above. I changed by old vodafone no. to a new reliance no. successfully. All banking related sms are receiving to my new reliance no. Today I tried to link my Aadhaar to sbi account and I noticed that the uneditable mobile no. in the aadhaar linking section is still showing my old vodafone no. which is still active and is used by someone. In the mobile no. change section of my profile page on SBI online, there is my new reliance no. This is crazy, I’m not able to link my aadhaar with the old number still there in the aadhaar linking section sbi netbanking. Can anyone help me to fix this issue? Hello, please complain using SBI complaint forum. Here is link click. Your error will correct soon. To link aadhaar with bank account i suggest you visit branch and submit Aadhaar copy. My SBI branch allow me to send aadhaar copy through WhatsApp and email. @editorial team: I have a same issue and I am NRI can’t even go to branch to do it. Is there any way to link adhaar and pan ? I suggest you guys to just close yr account and be tension free. bacause, you only can get tension from SBI nothing else. And I am not even registered for online banking.